The Doris Duke Monument Foundation (DDMF), an offshoot of the Newport Restoration Foundation (NRF), has delivered an installation at Queen Anne Square in Newport, RI, with a dual purpose. It was created to honor the memory of Doris Duke, who championed Newport’s historic preservation and left an enduring legacy of historic architecture; and created to honor the effect of historic preservation as a catalyst for community revitalization. The installation, entitled ‘The Meeting Room’, was created by Maya Lin, an artist selected for her thoughtfulness in approaching the site, its historic context, the visitor, and the important contributions made to Newport by Doris Duke. The landscaping was designed by Edwina von Gal, a talented landscape architect whom Maya Lin personally selected for this project. Nick Benson, renowned local stone carver, whose family has collaborated with Maya Lin on past projects, carved quotes from historic Newport documents in the thresholds of the three foundations that make up the installation. Great care was made to make sure this artistic public space and landscaping fit into the site and not overwhelm it. This is a gift to the City of Newport on behalf of the Doris Duke Monument Foundation. It will be a place where residents and visitors alike can engage in reflection and enjoy the center of Newport’s Historic Hill. The installation, entitled ‘The Meeting Room’, was installed in the green park space known as Queen Anne Square, land on which Doris Duke spearheaded saving in the early 1970s; and which had seen a cumulative period of decline over the last twenty years. For its reclamation, the DDMF had three objectives in mind. The first was to revitalize a park which was an early project of Doris Duke and the Newport Restoration Foundation in 1974. The second was to pay homage to Doris Duke and the remarkable heritage of historic preservation in the City of Newport. The third was to continue the Duke tradition of giving back to the community. finally, an enhanced public reputation for the City of Newport in general. The DDMF, currently under administration of the NRF, is fledged as a fully-formed and independent 501(c)(3) which will continue to oversee maintenance and administration for Queen Anne Square. In future years, it will carry onas a ‘Friends’ organization. The project received approval by the City of Newport in December 2011. Construction began in October 2012. 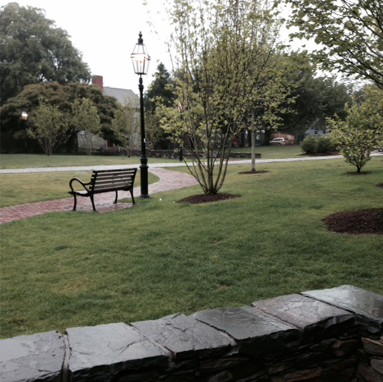 The park was completed and dedicated on May 31, 2013. The project at Queen Anne Square has been funded through private sources, grants and donations. NRF provided seed money to complete the design phase. Funds have been raised by the Doris Duke Charitable Foundation, van Beuren Charitable Foundation, Marion Oates Charles, Hamilton Family Foundation, Alletta Morris McBean Charitable Trust, Rose and Charles Dana, Prince Charitable Trusts, David B. Ford, Edward W. Kane and Martha J. Wallace. The DDMF board will be responsible for disbursing money from the fund and working with the NRF and the City to provide ongoing maintenance. The City will continue to be responsible for mowing the grass, all sidewalk and path maintenance, and trash removal as they are now. The DDMF will provide ongoing, additional landscape maintenance from its existing grounds crew. Although modest, the endowment will be sufficient to provide for hardscape maintenance expenses, graffiti removal and lighting upkeep. It was a central design concept that the structural budget costs of park maintenance be kept to a minimum.